To help kids understand the meaning of prayer, have them each create their own DIY Prayer Jar. 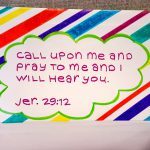 This activity can go along with a discussion about what prayer is, why we pray, and specific Bible versus related to prayer. You can also adjust the craft to go along with your lesson. If you are teaching about how to be thankful, create Gratitude Jars. To teach them to be mindful of all the positives that God has given us, create a Blessing Jar. 1. First, you will want to add some color to your Mason Jar! To get the sheer, matte look: Pour elmers glue into a paint cup. Add a few drops of liquid watercolor (choose from red, yellow, blue, green, orange and violet). Mix it in with the glue. Add more watercolor if you want a darker color. We used a little bit of blue to get a pastel blue, and a little bit of red to get a pastel pink. Use a paintbrush to brush the mixture onto the jar. NOTE: It will look streaky at first, but dries smooth. To get an opaque, shiny look: Pour arylic paint into a paint cup. You can mix colors if you’d like. Paint the entire jar, then wait until it dries. Add a coat of Mod Podge to prevent the paint from chipping off of the glass, and to add some shine. 2. Embellish your jar however you would like. We added craft trim around the top of the jar, sticky gems, and some fabric scraps from an old tie dye shirt. You can wrap them around the jar and use tacky glue to hold them in place. We also cut some small pieces of burlap ribbon and wrapped it around the blue and purple jars. It’s best to use hot glue to hold this in place. For the pink jar, we wrapped colorful hemp around the middle. Be sure to start off with the string in the back and finish it in the back so it won’t show. 3. Add some wood pendants. First, decorate them (some examples are in bullet points below). Use the colorful hemp roll to tie a larks head knot (find the middle of the string, make a loop, then pull it through) which is great for handing pendants. We also used hot glue to hold it in place. Dove: Paint with white acrylic paint first, then added Mod Podge and sprinkle glitter over it before it dries. Angel: For a natural look, don’t paint the pendant. You can add sticky gem, etc. 4. Add a banner to label your jar. Use paper cardstock and cut out triangles. Then write the letters P-R-A-Y in marker. Glue the triangles to the twine with tacky glue. Wrap it around the jar. Now your Prayer Jar is done and ready to use. 5. Add Jumbo Craft Sticks for a fun activity! See below. Gather some Jumbo Craft Sticks, and bring your group together to write specific prayers, positive sayings, things to be thankful for, or names of community groups you would like to pray for. You can even write Bible verses on the craft sticks if you’d like to introduce a discussion on a specific topic. Place the craft sticks in the Prayer Jars. When you are ready for the activity, each person will pull a craft stick out of the jar and follow what it says. This is a great activity to help both kids and adults with prayer, reflecting, and understanding the blessings God has given us. If you choose to relate this to a Bible Verse on these topics, we’ve listed some below. “Be joyful always; pray continually; give thanks in all circumstances, for this is God’s will for you in Christ Jesus” (1 Thessalonians 5:16-18). 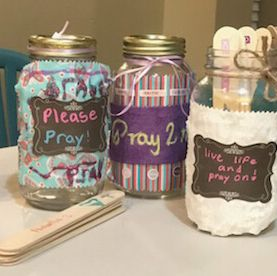 Check out this photo shared by Laura on Pinterest showcasing her own Prayer Jars! 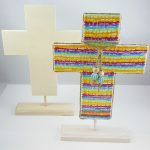 We love this creative and meaninful craft, and it’s a great group activitiy for Sunday School, Bible Study, or any other religious groups. 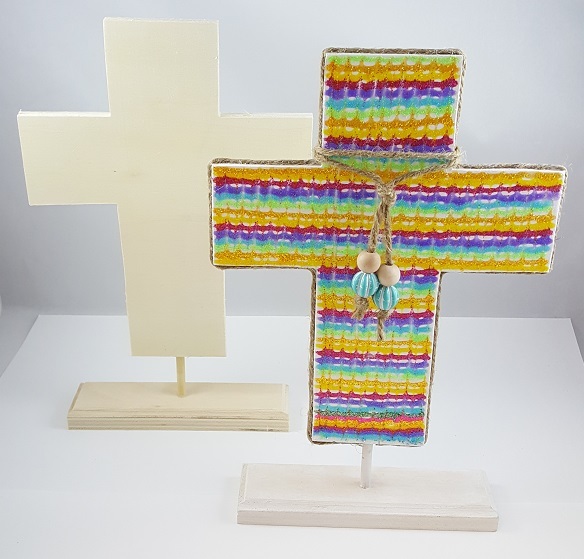 For even more crafts and lesson ideas, visit our Religious Activites category on the blog. 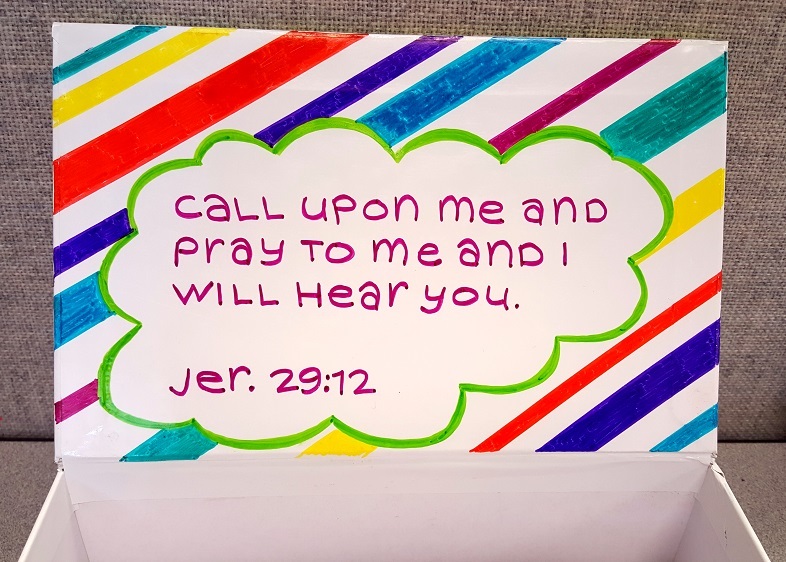 This entry was posted in Religious Activities and tagged Bible, Bible School, Bible verse, Blessing Jar, christian activity, christian craft, christian lesson, God, Gratitude Jar, jesus, Lord, prayer, Prayer Jar, praying, religious activities, sunday school by S&S Worldwide. Bookmark the permalink. Whoa, the weblog is so energetic has displayed a brilliant article. My child has made the prayer jar by reading it and has taught correctly. Such a pretty and nice craft which looking so Holy type for the Jesus symbol. Love all your ideas. Will probably use This one with RCIA adapted for children. 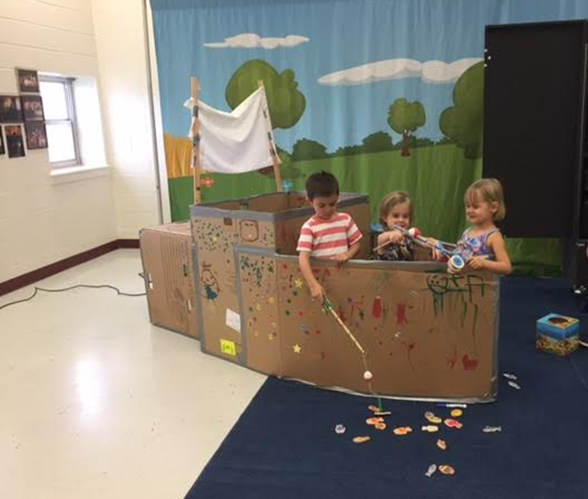 hey love this idea and want to use this for our VBS coming up. I am having issues though finding where to purchase the Christian wood pendants. Can you please help me. 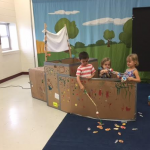 Hi Michelle, great to hear you are using this activity for your VBS! Here is the link to those wood pendants: http://www.ssww.com/item/product-BE1385/. Let me know if you need anything else! Thank you so much for your quick reply. Our church orders things for that company, but I never thought to look at that company. Did you paint the outside or the inside of the jar? Wonder if it would have a different effect either way? Hi Crystal, we painted the outside of the jar. The color and texture may not show up as much if you paint the inside, but you could try it and let us know how it comes out! What beautiful activitys please send my grandaughter this site.